Are vegan and vegetarian patties from Beyond Meat, Amy's Kitchen or Impossible Foods better than the real deal? April 10, 2018, 7:10 PM UTC / Source: Eat This, Not That! When shoppers scour the freezer section for the perfect veggie burger, they're often looking for an adequate amount of both satiating fiber and protein. After all, sometimes swapping a regular beef burger for a plant-based patty means you’re willing to compromise flavor for nutrition. However, the Eat This, Not That! team believes you can have the best of both worlds. To help kickstart your veggie-centered diet, convert a carnivore or save the planet (hey, 460 gallons of water are required to produce a ¼ pound of beef), we rounded up some of the most popular meatless burgers in the supermarket and graded them based on nutrition, ingredients, appearance/texture and taste. Take a look at the winners below and, if you're still craving veggies, try your hand at one of these 30 vegetarian soups for weight loss. Nutrition: Meatless burgers can provide a solid dose of plant-based protein in addition to digestion-aiding fiber, but if a patty is packed with a frightening amount of fat or salt, then any nutritional benefits from the fiber may be lost. Ingredients: Besides being concocted with the legumes, rice, and veggies, many patties contain a plethora of unpronounceable ingredients that aren’t found in nature. To make sure your burger is aligned with your plan, we’ve combed through each and every ingredient among the burgers we tried. Appearance and consistency: Does your burger crumble apart on the grill, failing to hold up to the heat? Or does it perpetuate veggie burgers’ unfortunate too-chewy reputation? Aside from taste, appearance and texture remain an important metric when talking about any food. Taste: When we bite into a veggie burger, we expect it to taste like what it’s made of: vegetables. Except more like perfectly braised, generously seasoned and ever-so-slightly caramelized veggies — nothing too salty, grainy or unpleasant. Without further ado, here are our top five picks. Ingredients: This burger packs in pea protein, black beans, carrots, sweet potato, and butternut squash and is seasoned with roasted garlic, onion powder and sea salt. Appearance & Consistency: We liked this burger’s hearty and somewhat dense texture. It filled us up without filling me out. It’s speckled with all the ingredients listed: black bean studs and traces of bright orange carrot. The flavor was reminiscent of mashed potatoes and peas, so if you learned to tolerate your childhood dinner nightmare, you’ll probably like this burger. And given its stellar carb to fiber ratio — and the fact that it packs a solid amount of protein — the burger might be just what the doctor ordered. Ingredients: This burger's base is made of wheat protein, coconut oil, potato protein and heme — which lends the burger its meaty taste and aroma. Appearance & Consistency: This plant-based burger looked like a heaping helping of pulled pork. Biting into it revealed an unexpected mushy mouthfeel that somewhat resembled ground meat ... but not quite. Taste: If you’ve ever had jackfruit, you’d probably agree that this pick tastes just like the fibrous fruit. While the outer crust crisped up nicely, that’s about the only part of the burger that tastes like real meat. The fleshy insides, dismayingly, didn’t deliver that flavor. Given that the Impossible Burger is made to mimic meat’s texture and flavor, we were expecting to be fooled by its plant-based architecture. Not quite. The burger was indeed tasty and undoubtedly more satiating than many of the other candidates, but it's not a great stand-in for real beef. Ingredients: The most abundant ingredients include cooked and organic whole grain millet, adzuki beans and whole grain quinoa, as well as organic coconut oil, onion and sweet potatoes. Appearance & Consistency: It's great that you can see the whole foods lurking in this burger, mostly the curdled quinoa and cubed sweet potatoes. The burger's overpowering peppery scent foreshadowed its delightfully zingy flavor. Taste: Just as expected, this burger came with a kick — mostly from the chilies, cumin, lime and apple cider vinegar. Even though Hilary’s offering is marketed as a “bean burger,” the patty had more of a textured quinoa and millet flavor going for it. Aside from boasting a clean, balanced flavor without an overwhelming amount of salt, we loved that one of the main ingredients in this burger is quinoa — a complete protein that contains nine essential amino acids (just like meat does), deeming it a solid option for vegetarians and vegans. While Hilary’s bean burger may not play the part of a perfect post-workout meal (given its relatively low protein content), pairing this pick with some extra veggies for fiber — and perhaps a dollop of creamy cottage cheese for protein — would be your best bet. Ingredients: Amy’s veggie burger is packed with organic ingredients such as mushrooms, onions, bulgur, celery, carrots, oats and walnuts. Appearance & Consistency: The burger patty itself was fairly small and smelled like truffle fries — a first impression justified by its first ingredient: mushrooms. The cooked bulgur grains and crunchy walnuts dominated this burger’s texture. Taste: If you’re ever craving a comforting bowl of mushroom risotto, save yourself the unnecessary calories and fat by grilling this veggie burger instead. The patty was rife with umami, garlicky notes that only tasted sinful, but the flavor profile remained authentic to the ingredients. Taste-wise, this patty deserved an A+. It’s not overly salted and has a satisfying crunch with a delicate, earthy ‘shroom flavor that would pair well with a slice of Havarti or melted mozzarella cheese. Nutritionally speaking, the patty doesn’t offer up enough fiber or protein to fill you up, so you’ll want to opt for tossing it on a sprouted whole-grain bun with fresh lettuce and tomato for extra satiating power. However, we do like that most of the healthy fats in this pick come from omega-3-packed walnuts. Appearance & Consistency: In its packaging, the Beyond Burger looks exactly like a ground beef burger (it's even found in the meat section!). Flipping it over revealed an eerily pink, fleshy patty that was in dire need of a direct flame. Although it wasn’t oozing blood, it does ooze beet juice, so cooked it to well-done. Texture-wise, you wouldn’t be able to tell it apart from ground meat. Taste: After broiling it for about eight minutes on each side, the patty came out with a slightly charred taste and strikingly meat-like flavor. We thought that it tasted just like a burger made with a blend of ground chicken and ground beef. Whether you’re a proud carnivore, devoted vegetarian, or newbie vegan on the verge of caving, you’ve gotta throw this bad boy on the grill. The Beyond Burger is beyond juicy, meaty and an almost-exact replica of a poultry patty. While it looks, cooks and even bleeds like a beef burger (chalk that illusion up to the beet juice), it also packs in more than double the amount of iron and nearly half the saturated fat found in an 80-percent-lean beef burger. Looking to serve up some shock value at your next backyard barbecue? This burger pick will do the trick. 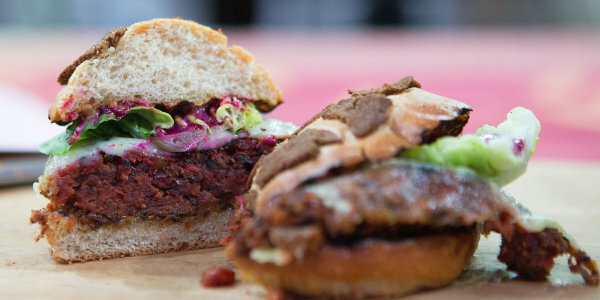 Check out the full ranking of veggie burgers on Eat This, Not That!